Description: This is a very strenuous trek. It can be done either as a 12 mile day hike or a 14 mile over-night backpack. I named this loop after a very energetic PATC trail builder, Wil Kohlbrenner, who besides writing trail guides for the Massanutten Mt and the Great North Mountain and performing the constant task of trail maintenance, constructed several miles of trail in GWNF. Wil passed away in April, 2005. I met the man briefly last year at the top of Long Mt on the Great North. We just had time for a handshake back then. The first 4 miles of today’s trek were Wil’s. 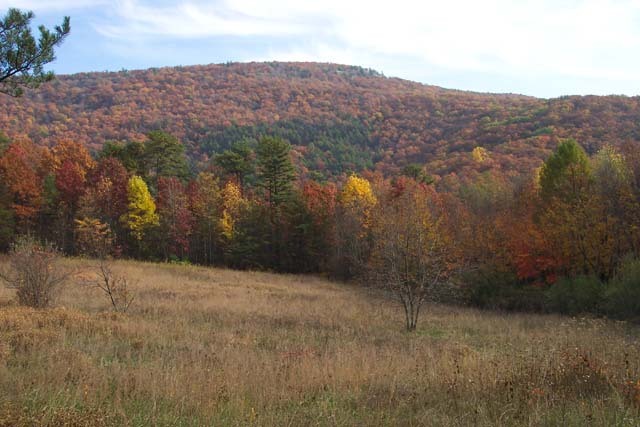 First you follow a seemingly gentle grassy woods road up to the west ridge of Massanutten Mt. You then turn north and follow the ridge, some times along the top and at other times it drops down along either flank as Wil’s trail deftly avoids even more difficult areas. 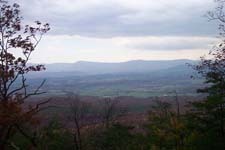 Then you’ll climb up to the top of an overlook that Wil really must have worked hard at for great views of the valley. You then descend to Crisman Hollow only to ascend up the steep and rocky Creek Gap Trail to Scothorn Gap Tr. You get a 2 mile reprieve from all of the rockiness that defines much of the Massanutten trail system as you walk along the almost sandy rolling hills of Scothorn. Then you’ll descend steeply into a hollow between Middle and Waterfall Mountains for another 2 miles only to make a hard right turn to climb 800 feet of Waterfall Mountain in less than 0.6 miles. The rest of the hike is a nearly flat walk through recovering woods and wildlife clearings. I have to admit this has been the most challenging 12 miles I’ve ever hiked, even more so than the 13+ mile Green Ridge Hike described elsewhere on this site. Allow a lot of time for this one. It’s probably best to do it in the early spring but after the time change when the days first become long but the temps are still mild. Bring extra water and some food as all of the ups and downs and the rocky tread will leave you fatigued. Allow a lot of time for this one. It’s probably best to do it in the early spring but after the time change when the days first become long but the temps are still mild. Bring extra water and some food as all of the ups and downs and the rocky tread will leave you fatigued. 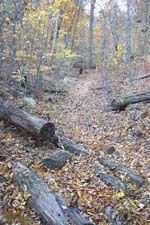 Look for a parking loop on the left and orange blazes on the trees where the trail crosses the road. Note: Crisman Hollow Rd is closed in the winter. Contact the Lee Ranger district at (540)984-4101. Trail Notes: Begin the trek by crossing the bearm blocking the west trailhead. Follow an old woods road, steeply at times, up the side of the ridge. At 0.27 miles the trail splits. Turn right and continue to follow the orange blazes. Over the next 4.2 miles you will walk along the ridge of Kearns Mountain, sometimes on the very top and sometimes on either flank. The tread is extremely rocky! Some overlooks are obvious. For more views just climb up onto the nearest rock outcrop. 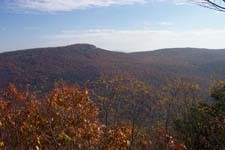 Arrive at the junction of Jawbone Gap Trail (Blue blazed) and an overlook trail (white blazed, straight ahead.) The Massanutten Tr makes a sharp left here. The views are worth the climb up to the top of the overlook but if you’re backpacking you may consider stashing your load first. Descend on Jawbone Gap Trail. Initially it will be a footpath. In 0.5 miles arrive at a woods road. Turn left here. In a short distance another road will come in sharply from the right. Stay straight, following the blazes. Turn right onto a hard gravel road at the next intersection and follow it to Crisman Hollow Rd. Turn right and in a few yards bear left onto another old woods road. This is the beginning of blue blazed Creek Gap Trail. There are primitive car campsites along this road. The trail turns left through one and crosses Passage Creek on a bridge. Climb steeply up Creek Gap trail. In 1.2 miles the Creek Gap Trail makes a hard left turn and Yellow Blazed Scothorn Gap Trail goes straight. The sign is missing but the blazes are obvious. Follow Scothorn Gap Trail. 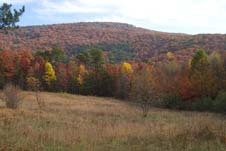 In 1.52 miles reach the junction with the Orange Blazed Massanutten Trail (Left and Straight. Scothorn Gap Trail makes a hard right here.) Stay straight joining Massanutten Mountain Tr going south. 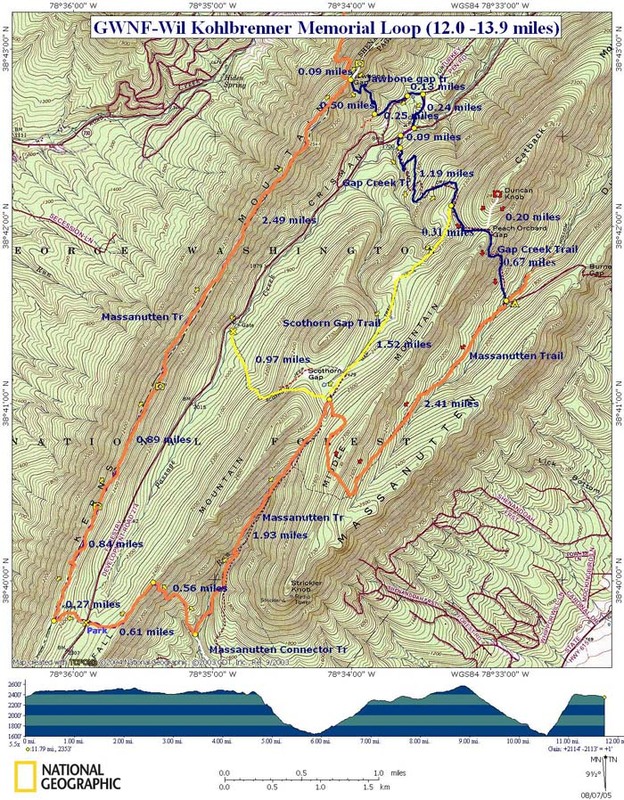 Descend 1.93 miles to the junction of the white blazed Massanutten Mountain Connector Trail. You will cross a small stream twice in the process. Turn right to stay on the orange blazed trail and climb very steeply for o.56 miles to the top of Waterfall Mt. At the top make a left turn (The old trail goes straight. Avoid this.) and in 0.61 miles reach Crisman Hollow Road and your car. Critique: As with the previous reviews, this hike lives up to it's strenuous rating. 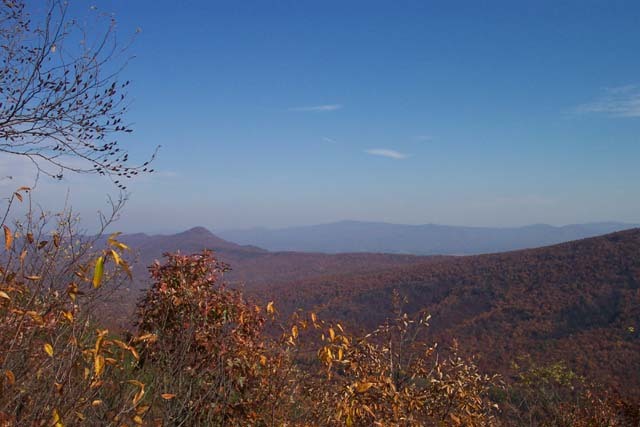 I coupled that with hot humid weather and adding an out and back to Strickler Knob. The result was a muscle numbing 14.7 miles. I found the initial hike along Kerns Mountain to be extremely fun and is, to date, the best trail I've experienced. It does offer some varied terrain , switchbacks and some crisscrossing of the ridge line, but all the better. It is relatively level, and it just made me want more. It is very well maintained and blazed nicely. The overlook at Jaw Bone Gap is a must. 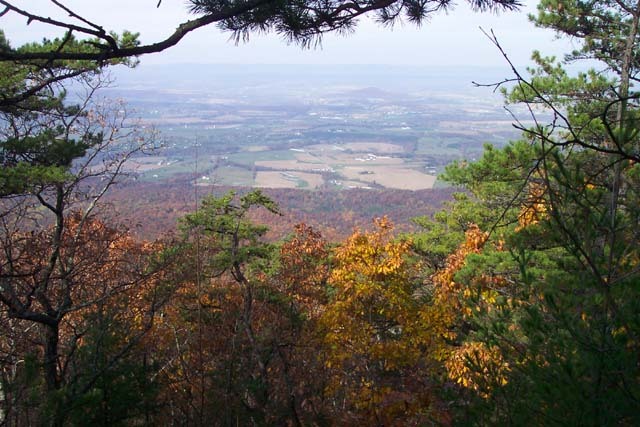 Though vistas would be greatly improved without leaves, there are some nice views throughout the length of Kerns Mountain anyway. Descending Kerns was not too bad, and I spotted the first of what would be three bear sightings for the day. 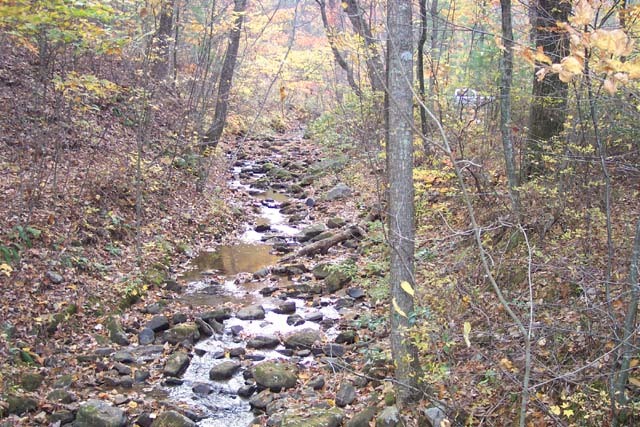 Passage Creek, upon crossing Crisman Hollow Road, offers a chance to cool feet and resupply water. Payment on fatigue now begins with the ascent on Gap Creek trail towards Duncan Knob. The next two bear sightings I had were on this trail before I got to Scothorn Gap Trail. The last was opportunity enough to get a blurred pic and just stand quietly and admire the beautiful 300 or so pound Black Bear. He never noticed me. I chose to take the Scothorn Gap Trail as I had already been to Duncan Knob a short while ago, and because I intended on making my way out to Strickler Knob. Scothorn Gap Trail is fairly uneventful, but seemed like a unexplored trail to me since I had seen it without leaves earlier. 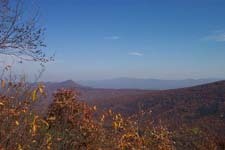 I made my way to the Strickler Knob trailhead at the top of Middle Mountain. The new trail turned into a mile long bushwhack and rock climb! The trail is blazed Magenta, purple, and red. No uniform color. It is poorly blazed and one needs to exercise caution not to get off trail, though once you are heading down the side of the mountain should tune you in to the mistake made. This is not for inexperienced hikers. The rocks are slippery when wet and scrambling over them is just the beginning. The end out at the knob requires non-technical rock climbing and is very demanding. I sat on the knob recovering from the journey, sizing up Waterfall Mountain, knowing I had to descend into the ravine and then climb that monster. This was about the time I was swearing at Mike (kidding). I made my way out of Strickler, holding up in a rock overhang to let a thunderstorm pass. The rocks were indeed treacherous after the rain. I made my way down to Scothorn gap Trail again and then down towards the Massanutten Connector Trail. I was again able to filter water at a stream, a godsend since I was sucking water fast at this point. Waterfall Mountain kept rising like some monster above me to the right as I headed down. Finally the ascent started and it is truly grueling, especially after hiking for so long. It becomes personal and you just want to beat the mountain. Switchbacks are few. Plan on adequate water and frequent rests. I wanted to kiss the ground when I reached the summit! The remainder of the hike is level along the ridge until you descend slightly to your car. This is a challenging hike even without doing Strickler Knob. It is also extremely rewarding and filled with wonderful scenery. A must do for the serious hiker. Critique: The hike write-up is very accurate, but a bit tame, as it were. 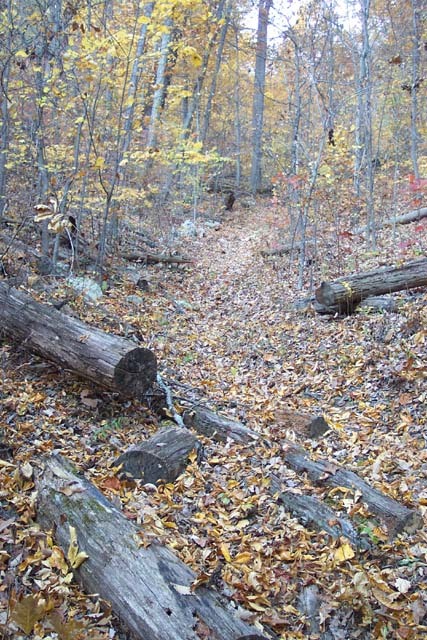 The first 4 miles along Wil's trail is rocky and slow, and eventually seems to sap one's energy needed for the long climb to the Scothorn Gap Trail near Duncan Knob. 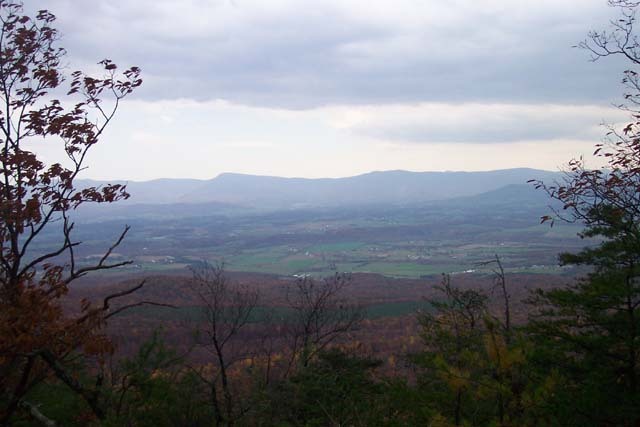 Views are good on a clear day (a bit hazy when we scouted it), and the final view resulted from a meandering Waterfall Mtn Trail relocation to both access the view and evade a steep downhill (the trail comes out to Crisman Hollow Road flat!). 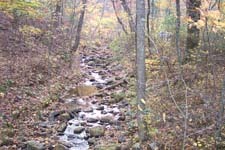 Besides views and hills, there are a few nice streams and ponds, as well as a dark hollow before the grueling climb up Waterfall Mtn. While the later is tough at the end of an already 10 mile hike, the downhill would take its toll on middle age knees too early in the hike, and make the steady moderate uphill to a wagon wheel trail junction tiring. 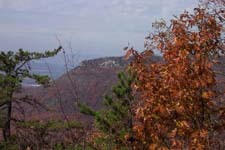 Other options in the area are a rocky climb to the Duncan Knob view, and a few added miles to circle Middle Mtn. Certainly a hike to be repeated in cooler AND drier weather! Critique: As said on the website, this loop is extremely challenging compared to the other hikes in the region. Make sure you and anyone else with you are prepared. The hike from the trailhead to Jawbone Gap is pretty difficult hiking--plenty of rocks and constant rises and dips. There is no significant elevation change, but it isn't level. There are some decent views to the west. 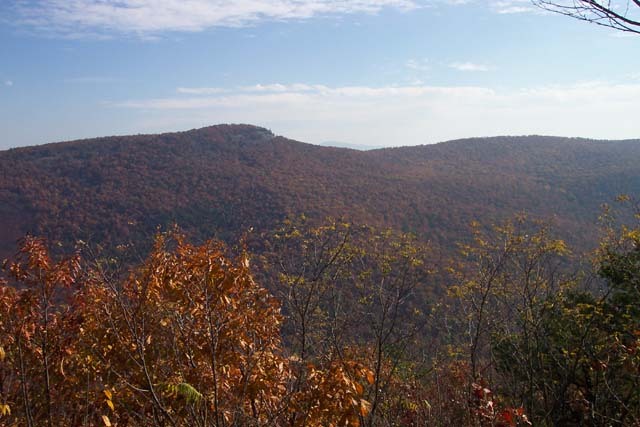 Jawbone Gap is a short climb up to an excellent view of Duncan Knob (straight ahead) and Kennedy Peak (Northeast). The hike through the valley features a pond, a memorial for "Backtracker" (does anyone know who this is? ), and a nice bridge over Gap Creek. I did this loop twice in April 2006, and on the second time there was some decent rain beforehand. This made the climb up on the Gap Creek trail pretty muddy, but not too bad. Coming from Duncan Knob from either side is tough, but it seems to be a bit more gradual coming from the valley, as you will on this hike. If you have the energy to go up to Duncan Knob, certainly do it, as the rocks are fun and it's a good view at the top. We found the best overlook to be on the right side. There's a pretty gradual walk along the East Side of the Massanutten Trail, and then a little shaded descent to the stream. Make sure you're hydrated enough for the straight up climb up Waterfall Mountain. The first part of this is not switchbacked at all. This is tough anytime, but particularly challenging after 15ish difficult miles. The nice part about getting to the top is there are some more good views, including one of Duncan Knob. Also, you have a real easy walk to the cars from here. I agree that this is best to do in Daylight Savings time, and before it gets too warm.